In capillary electrophoresis, it is commonly considered that even a moderately high ionic concentration in the background electrolyte (BGE) leads to high currents, resulting in Joule heating and serious peak distortion. As a new approach to overcome this problem, zwitterionic (Zwittergent-3-14) and/or non-ionic (Tween 20) surfactants have been added to BGEs containing high salt concentrations (e.g. 0.3 M NaCl) and have been shown to result in acceptable separation currents (<200 µA). In turn, these BGEs could be applied to the separation of samples containing high salt concentrations (such as undiluted seawater) without the occurrence of any significant peak broadening due to electrodispersion of the sample. 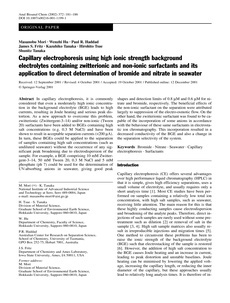 For example, a BGE comprising 10 mM Zwittergent-3-14, 50 mM Tween 20, 0.3 M NaCl and 5 mM phosphate (ph 7) could be used for the determination of UV-absorbing anions in seawater, giving good peak shapes and detection limits of 0.8 µM and 0.6 µM for nitrate and bromide, respectively. The beneficial effects of the non-ionic surfactant on the separation were attributed largely to suppression of the electro-osmotic flow. On the other hand, the zwitterionic surfactant was found to be capable of the incorporation of some anions in accordance with the behaviour of these same surfactants in electrostatic ion chromatography. This incorporation resulted in a decreased conductivity of the BGE and also a change in the separation selectivity of the system.